The garden of the Hesperides is Hera's garden in the west .Where there is a single tree on which golden apples grow .lt's guarded by Ladon, a hundred-headed dragon.The apple planted from the fruit branches that Gaea gave to her as a wedding gift when Hera accepted Zeus . 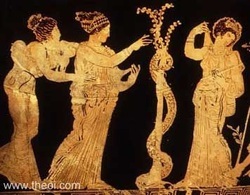 The Hesperides were the goddesses of evening and golden light of sunset.The three nymphs were daughters of NYX (night) or the heaven bearing Titan Atlas.Thry were entrusted with the care of three of the golden apples which was first presented to the goddess Hera by Gaia(earth) on her wedding day. Hercules' 11th labor was to retrieve the golden apples from the garden of the Hesperides .First,he flattered 'the Hesperides,but they didn't give him the apples .Then he found Atlas and conuinced him the sky for a little so Atlas went to see his daughters and they gave him a golden apple .The Atlas gave the apple to Hercules .